By Mark Dreger - Current Affairs Editor · September 23rd, 2015 at 10:13 a.m. Many refugees from Syria, Iraq, Libya, Afghanistan, and other Middle Eastern and African countries arrived at their desired destinations earlier this month after challenges in Hungary. Hungarian authorities on September 3rd allegedly tricked hundreds of refugees onto a train that took the refugees to a camp in the town of Bicske outside Budapest instead of Austria or Germany. A group of 64 refugees escaped the camp the next day. The Hungarian government reiterated that illegal migrants would only be allowed to travel if they have the necessary documents, as Hungary considers the refugees illegal migrants. As impatience grew, several hundred refugees began walking from Budapest to Vienna, a 250km journey. It wasn`t until the night of September 4th that the Orbán allowed refugees in Budapest to ride buses to Austria, which stopped 2km short of the border. Many did not trust the buses, but due to excessive exhaustion many got on board. Austrians welcomed the refugees and some rail workers volunteered their time to drive refugees around, but police warned them not to cross the Hungarian border as they could be prosecuted for people-smuggling. The Hungarian Prime Minister, Viktor Orbán, defended his necessary methods as protecting European Christianity from the influx of Muslims. Orbán also blames Germany for encouraging more refugees to come to Europe, which he believes will reach millions. Hungary has closed its border with Serbia and has passed legislation against illegal border crossings that could result in migrants being deported back to Serbia. German chancellor Angela Merkel has asked for other EU nations to share the refugees, with up to one million refugees, about 1% of Germany’s population, expected to seek asylum in the country. Britain, Ireland, and Denmark are exempt from taking in refugees, but Ireland and Britain have both succumbed to pressure with British Prime Minister David Cameron announcing that Britain will accept 20,000 refuges over the next five years. Spain and eastern European countries like Poland, Slovakia, and the Czech Republic are not as compliant and are under heavy pressure to follow Germany’s policy. Although Germans in the east protest and attack refugee camps, Germans in the west have accepted the new arrivals. Hundreds of Germans in Munich and Frankfurt cheered and clapped when the refugees arrived, as they gave out food, clothes, and even toys and diapers for the children and infants. In fact, according to The Guardian, people donated so much that the police made them stop due to the overwhelming volume of items. The crisis has led to the creation of a group called Fluchtlinge Wilkommen (Refugees Welcome) that allow families to open their homes and take in refugees for up to one year. 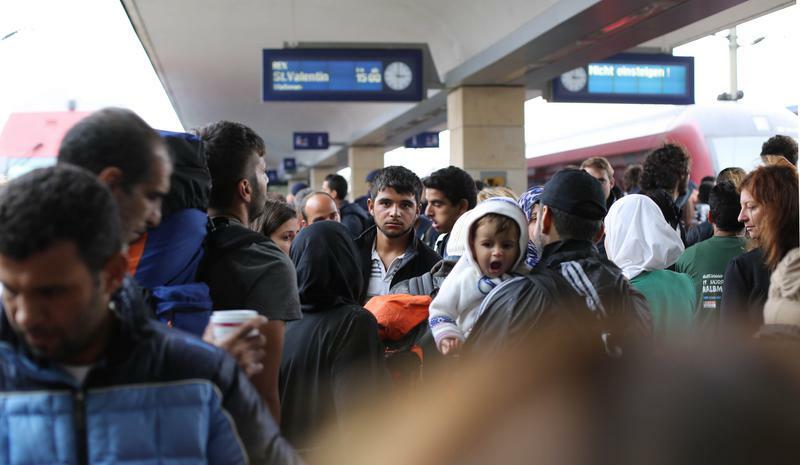 On September 13th Germany halted train traffic with Austria, as 13,000 refugees arrived the day before. Russian President Vladimir Putin has called the migration crisis payback for Europe for “blindly following U.S. orders” in the Middle East with intervention in Iraq and Libya. The United States plans to accept 10,000 Syrian refugees in the next year and Australia has offered to accept 12,000.